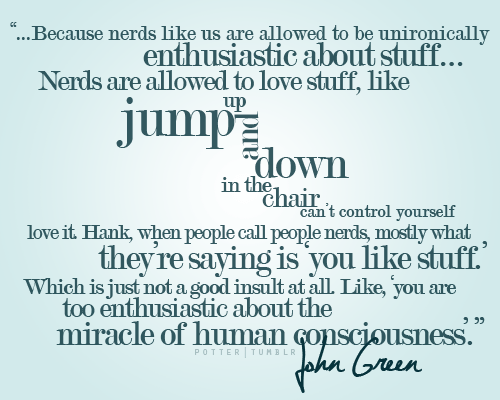 After I got into tumblr at the start of the year, I noticed a lot of people talking about being ‘nerdfighters’. It seemed like a cool thing to be but I could never be bothered to get into it because, well, at the end of the day I am extremely lazy. Then, a couple of weeks ago, I was chilling with Kayla and she was catching up on some youtube channels which she subscribes to and one of them was ‘thevlogbrothers’. She started talking about how epic they were and how cool it was to be a nerdfighter and when I admitted I had never actually gotten around to discovering what one is she forced me to watch some of the videos. It was love at first view. If you’re not familiar with who the vlogbrothers are or what being a nerdfighter is you should watch the below video. What I love most about the vlogbrothers is that they’re so fine with being nerds and in turn help others to realise that it’s awesome to be a nerd. As I had finally got around to becoming a nerdfighter, I then decided it was about time to take my friend Hannah’s advice and begin watching Charlieissocoollike. I had told Quack, Toong and Ell to watch him a few months ago and they had fallen in love with him and it honestly just took me to hear his accent before he was promptly added to my castle list. He has a kazillion hilarious vids that you should check out, but here’s just one. He’s playing the freaking ukulele, what’s not to love?! As I was going through some of Charlie’s vids, I discovered one called ‘The Charlie And Alex Format’, which reminded me of everyone on tumblr who was obsessed with ‘Alex Reads Twilight’. Alex is Charlie’s best friend. He’s equally British and equally epic, and Alex Reads Twilight is honestly the funniest thing I have watched in forever. Actually you told Quack and ell to watch charlie, then Quack made me watch him. The first vid I watched was Charlie reads Twilight, in the backseat of her car while Mummy and Alex (her alex) were in red rooster.Haha 'my name's bella and i'm sht in every way.' First chapter and he sums up the series.Loves itXoxo.. Toongen..